Late last night, the National Guard arrived after Mayor Zimmer made a public plea for their assistance on CNN. The State of NJ is a disaster area and the demand for assistance is long and only beginning. The mayor thanked Governor Chris Christie for his support in a tweet at 1:30 am. Many parts of Hoboken remain in several feet of water. Most points west of the flood zone (Willow Street) have seen record levels of water limiting Public Safety's resources to address problems and extract people. In an urban town of 50,000 boats and pick up trucks are in short supply. Both First Street and Observer are mostly blocked with deep water. The North Hudson Sewerage Authority pump is in reportedly in full operation. It's capacity is to move up to 75 million gallons of water a day and Hoboken has taken on an estimated 500 million gallons from the entry points of the Hudson River. It'll take days for the water to recede based on those estimates and the normal decline after high tide passed. Power restoration efforts can not start until equipment is free of water. PSE&G is working around the clock but that likely means power will not begin to be restored until waters recede and the target to see Hoboken back online is Monday, perhaps Tuesday. Some are forecasting sooner but until conditions permit, PSE&G will not be able to complete the repairs. Two shelters are set up after the back up generator at the Wallace School failed. Both are on Hudson Street: Sts Peter and Paul Church at Fourth Street and St. Matthews at Eighth Street. People are asking for blankets, pillows and items to help make the evacuated more comfortable. The mayor issued a twitter requesting Hoboken volunteers for rescue/supply operations with the national guard and to support the shelters. Anyone wishing to volunteer should report upstairs at City Hall 10 am. More than half of the City looks to be without power. Power in pockets around 11th and Bloomfield and Garden was evident last night. Stevens and Hudson Street from Fourth through 11th St have been with power although there was a sporadic report of an outage last night. All ferries are reportedly in operation today. The tunnels are open and midtown Manhattan and points north have power. NJ Transit and the PATH are both out along with the NYC subways. Amtrak is beginning service. A tale of two cities. Rarest of sights, while the Empire State Building was lit, most of the buildings surrounding it and almost all of downtown was out including the Freedom Tower. Hoboken is facing similar problem with most of the west and southwest of the City inundated with varying amounts of water and residents without power. 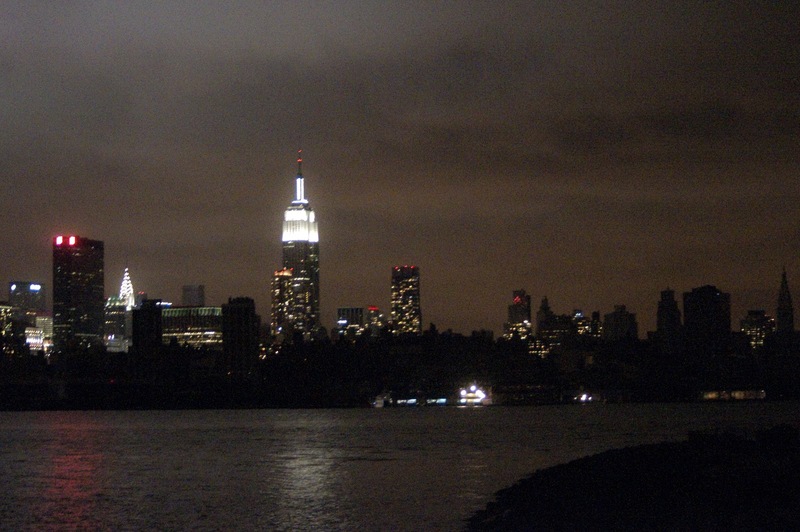 Talking Ed Note: How does a city of 50,000 eat without power? That's going to be a somewhat challenging question among many Hoboken will be facing in the worst flooding seen in living memory. Hopefully the NHSA pump will be making some significant progress but it's gong to be going full force for days. Today's the day many will not be going far. Please let others know, their neighbors need assistance. If you have time, volunteer upstairs at City Hall at 10 am.